RBTH turns the clock back a century and shines a light on the now-forgotten stories being reported on the inside pages of Russian newspapers in 1915 and the events and processes occupying the minds of the Russians of the age. Travel back in time with us week by week for a sense of what life was like in the twilight days of the Russian Empire. For its seedy aims espionage is also making use of the pigeon – the symbol of purity and innocence. The Telegraph has reported that over 200 doves have been delivered to Kiev from Galicia [in present-day Western Ukraine – RBTH]. The pigeons had been taken away from the peaceful residents of Galicia, who used the birds as spies to communicate with Vienna and other cities. The pigeons’ role was uncovered by our Lvov investigative department. What role does pigeon post play today? We posed this question to a military expert. "With the appearance of new perfected ways of transporting communication, some think that the role of the pigeon post is finished," said the expert. "It was thought that radio and the TV would eliminate the pigeon post. But in reality this is not so. As perfected as technology is, the radiotelegraph or the field telephone requires technical equipment, which for espionage is irrefutable evidence. The other thing is that a pigeon is a timid and peaceful bird. How will you know that such a pigeon, unlike its relatives, is carrying out a mission of betrayal under the guise of a "peaceful" citizen?" The German military administration has recently invited 18 neutral journalists from North and South America, Holland, Sweden, Romania, Greece and Switzerland to the battlefield to show them the special baths set up to cleanse soldiers of insects. In Alexandrov neutral journalists have inspected the grandiose bath that was built in the last two months at a cost of 1.75 million German marks. The bath has eight compartments and in the course of 24 hours can wash at least 12,000 people. The disinfection of boots and other leather articles belonging to the soldiers is carried out with the help of dry steam at a temperature of 95 degrees. Such baths, according to the Berliner Tageblatt newspaper, have been set up along the entire Russian border. On June 25 at 10 o'clock in the morning a huge swarm of bees arrived at the Kremlin and settled first on the roof of the Grand Kremlin Palace by the gilded foundation of the steeple and then on the walls of the Poteshny Palace and the Winter Garden. A part of the swarm flew into the building housing the department of Adjutant-General Prince Odoyevsky-Maslov, who is responsible for the Court Division. To remove the uninvited guests the authorities called the renowned beekeeper K. Startsev. A sensational piece of news has been reported recently: It seems that women will be allowed to study at university. However, people were surprised not by the news itself, but by the fact of the possibility of such an issue in our age. Actually, it is extremely strange to hear and read that the commissions developing the new university charter have not only raised this issue and not only debated it, but also, as it appears, have not resolved it, since there have been objections. It is a very old question. How many times has it been discussed and not resolved? 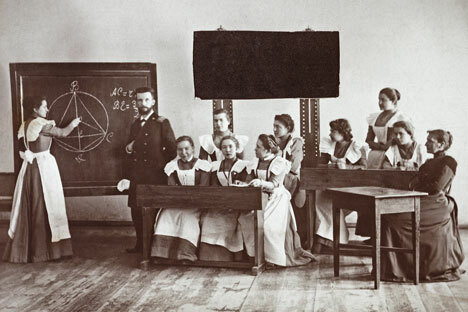 Women studied during the 1860s and in our age. Nothing bad has happened ever since they have been allowed to study the sciences, neither to the sciences nor to the university. But preconceptions are frightening in their incomprehensible power to sometimes muddle the most enlightened trends of our society.